Introduction of online shopping meant no more parking hassles, no more carrying heavy bags, no more dragging yourself out of comfort of your home and that’s why online shopping is one of the best things that have ever happened to shopaholics. I think it was one trigger that opened doors for many vendors to put up their stuff online. There are three reasons why I love online shopping one has to be convenience, second uninterrupted window shopping and third has to be deals. Deals and discounts are the main reason why we should shop online. But again shopping online is an art and if you don’t follow few tricks you can loose on those amazing discounts. In this writeup I will share some of my personal shopping secrets. First of all try to understand that there is not just one website which is selling, various online stores have mushroomed in past few years that are selling similar brands but at different prices. Each one of them keeps on running discounts and deals of various items ranging from clothing to fashion accessories to makeup and much more. I will focus on beauty and fashion segment. For e.g. at times you will find a deal at Myntra stating that shop for Rs. 1,000 and get 200 off and may be Shop Clues is giving another interesting deal which can benefit you more. And now with the introduction of Paytm mall you can find similar items there as well. Now if you go to each website and then compare the prices and discounts that are going to be pathetically time consuming task. In this world when we have handed half of our work to technology, why don’t we just tap our phone to get the best information. Zoutons has always been my favorite when it comes to looking for discounts and deals coupons. I can find all my favorite shopping websites current deals at one place. Ever since I have started using Zoutons I always visit this website to check for the latest offers and discounts before hitting “place order” on any given website. The team who is running Zoutons works hard to make sure we see only latest deals and all out-dated are automatically removed from the website. And now Zoutons have launched their app which you can download from here. The app has made my life so comfortable. Whenever I wish to shop I just first fill my cart on respective shopping website and then head over to Zoutons app to discover best deals available for me. 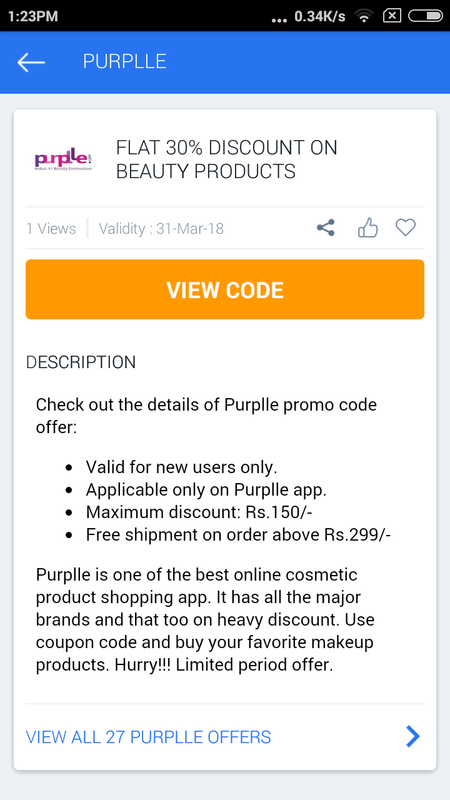 Even for beauty products you can find amazing deals like this one where by applying this code you can get flat Rs. 100 off. When I checked Myntra directly I couldn’t find this deal but upon checking Zoutons app I was able to discover about this deal and have already availed benefit from it. 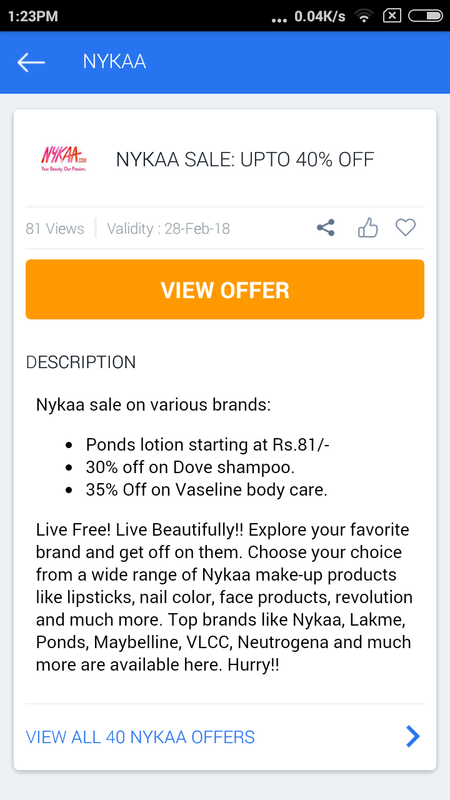 I love both Nykaa and Purplle for shopping beauty products. 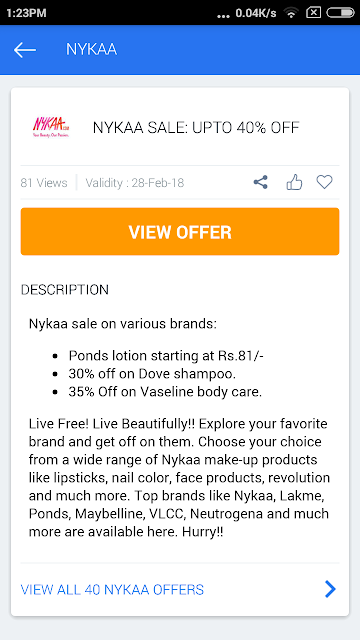 Upon scanning Zoutons app I landed on this coupon and my next click was Nykaa. 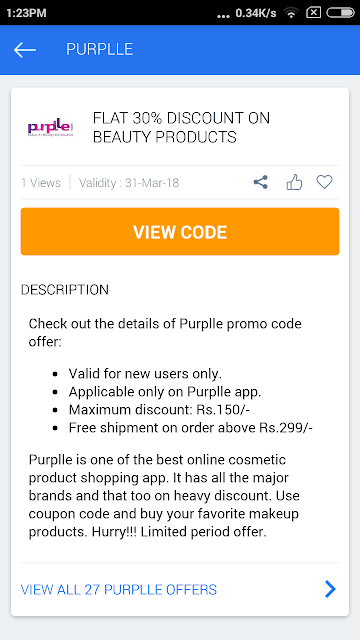 What I love about Zoutons is that once you click on one coupon it shows related offer like about Purplle Flat 30% discount deal. So I downloaded and used both the coupons to get maximum benefit. 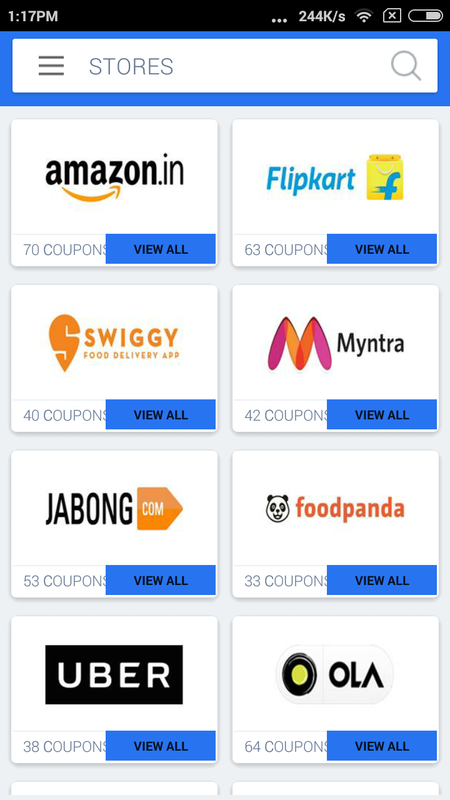 You can search for coupons category wise like for clothing and accessories, fashion accessories and even by shopping sites like Flipkart, Amazon, Jabong, Shopclues, Myntra and many other. The app is very user friendly and gives you exactly what you are looking for. Few days back I placed order on Myntra for tops and pants and while browsing Zoutons app I discovered that if I shop for two thousand rupees or more I will get flat Rs. 300 cash back. My order was falling short of five hundred rupees so I asked one of my friends to club her order. That way we both landed up in win-win situation. Even for Ajio I was able to find deal for my next purchases. 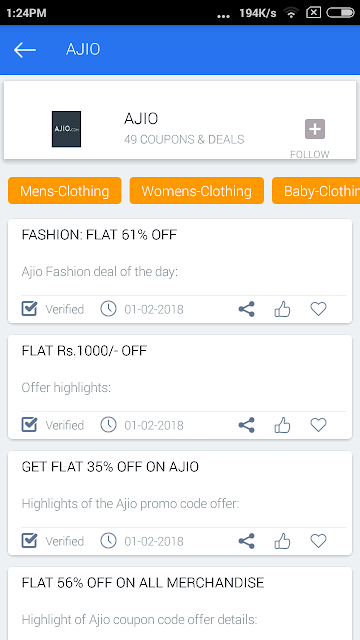 This is the first time I am going to shop from Ajio so definitely I am going to derive benefit from Rs. 1,000 off deal. Again I am going to club my friends order to place order in bulk. Online shopping can save your time and money both if you use few tricks that I shared above. I hope this was helpful and if you wish to download the Zoutons app click here.